Matilda and Me airs Sunday 3rd April at 7.40pm on ABC. Narrated by Tim’s sister Nel, who co-directed with Rhian Skirving, Matilda and Me tells the story of Matilda The Musical‘s journey to the Sydney Lyric Theatre, where the Australian production of the global smash hit opened last year. Through a mix of footage (including some rare family moments), interviews, musical performance and Australian Matilda The Musical rehearsals, Matilda And Me charts Tim’s long-term fascination with Roald Dahl and the intimate relationship that developed between him and the multi-award-winning musical, for which he is now internationally known. UPDATE: Matilda and Me will be available on ABC iView until 8:40pm on 18th April 2016, where you can now also watch SEVEN exclusive behind the scenes extra clips. 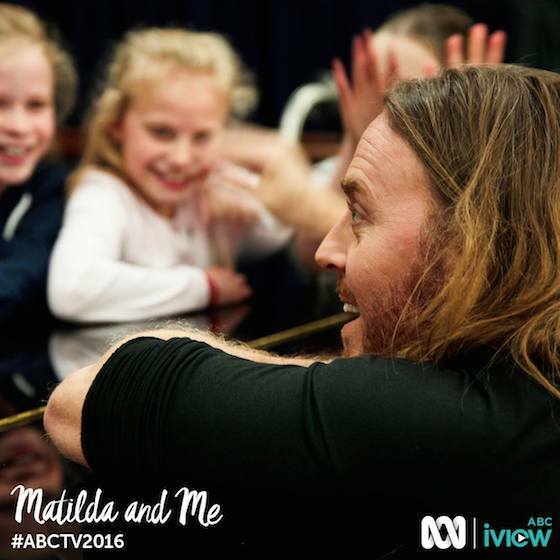 Matilda and Me is an IN FILMS production for the ABC. There are a few more details on our earlier announcement here. There’s no word yet as to whether this will become available outside Australia but, as always, we’ll let you know if we hear anything. Rats again – ‘too’ Now very red-faced. Rats – no edit button. ‘Naughty’ By the way applause for your Cardinal Pell video to, Tim. My three kids and I got the opportunity to travel to Sydney to see this musical in January. It was probably the best production I’ve ever seen. The lyrics and dialogue so clever that we bought the soundtrack and quite often burst into a rendition of ‘Naught’ at random times. Please tell the set designers, choreographers and actors that we were just so blown away. It’s good to have a clever sis!